Our collapsible bins are exclusively used to store and transport the products. It is effective and space saving solution for the diverse products contains various shapes and sizes. These collapsible bins are also stacked one on other. They are stackable in collapsed condition. They can stack too on loaded condition. 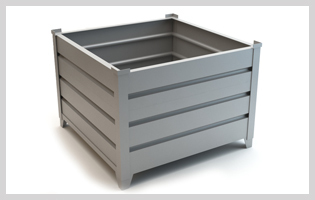 We make use of high grade steel and metals to fabricate the collapsible bins. We provide complete customize solution for required configurations.